Vertical Farming: Is This The Future Of Growing Cannabis? How do you get the highest yield in a small space? When you can’t spread out, grow up. Here’s why vertical farming is changing the way cannabis is grown. Farmland can be expensive and city lots are awfully small. When there’s no space to spread out, grow up. Vertical gardening is a practical way to maximize space and cut down on total costs of indoor cultivation. Many commercial operations already take advantage of the stacking approach, but vertical gardening offers a few benefits to home growers as well. 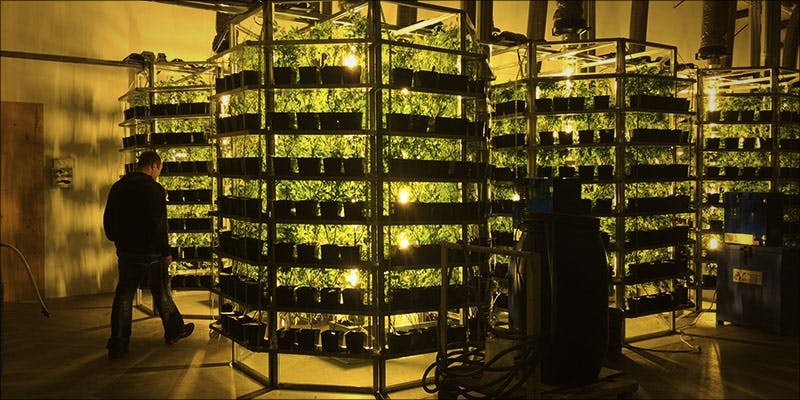 Here’s why vertical farming jut might be the future of weed. Anyone who has passed by a hop farm has seen the rows upon rows of vertical hop vines. While it may come as a surprise to many, cannabis, a relative to hops, also yields well in vertical systems. In fact, many warehouse commercial cannabis grows rely on vertical methods to take full advantage of space. While large commercial equipment is far from cost efficient for the average home grower, simple vertical gardens are easy to set up in your own home. Though, the initial cost of equipment can be a little costly, depending on the quality of the lights and other materials used. How does a vertical grow work? There are many different forms of vertical gardening. One of the most successful involves growing plants in a cylindrical hydroponic system with lighting suspended in the center. The effect is similar to the sea of green (SOG) method, in which clones are put into flowering about two weeks into the vegetative phase. This forces them to produce a large, central cola. To achieve high yields using SOG, many cuttings are needed, making a true sea of green. 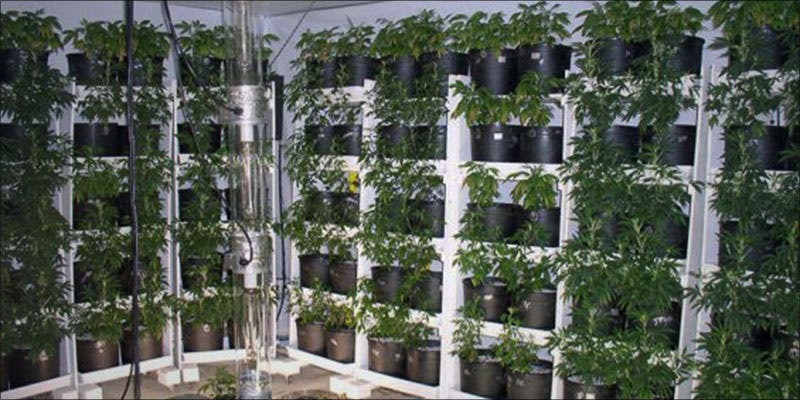 Vertical growing takes advantage of these techniques, allowing growers to produce many plants in a tiered system. Though, this method can also be used by small-scale growers looking to produce a couple of plants. This system allows growers to stack several levels of plants vertically around a central light, drastically increasing yield in a small space. In a video for Spacesaver, a company which sells vertical grow systems specifically for cannabis businesses, Jeremy Heidl of O.Pen Vape explains that going vertical has drastically increased his production. Of course, Heidl’s team had access to commercial equipment designed for lofty warehouse spaces. The benefits of vertical gardening go well beyond increasing yield and maximizing space. Vertical gardens can produce plants every day of the year, giving growers a continuous and reliable supply of cannabis. Different vertical gardening setups also take full advantage of a given light. This could be very beneficial for home growers who need to cut down on electric bills or are interested in reducing their energy impact overall. While outdoor cultivation, which takes advantage of a free source of energy, is perhaps considered the most environmentally sustainable, vertical gardening is a great way to make indoor operations more efficient, wasting fewer resources and cutting back on overall water use. In some states, like California, individual towns and municipalities are legally allowed to ban the personal outdoor cultivation of cannabis. In these cases, prospective growers have to turn indoors. Vertical farming is an excellent way for apartment dwellers or those in tight living quarters to get the most from their plants in a cramped location.